Board #1: First travel from distant U.S. cities. A board game that puts you on the road to Fun! 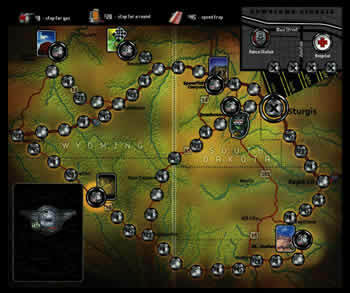 Recreate the thrill of the ride and the action with this unique board game.  Rally attracts a half a million bikers every year.  Specially deigned "Harley" bike markers.  The name of the game describes the purpose. An instant "I know whod like this" type of gift. Gorgeous hi-gloss graphics similar to the art work bikers have painted on their bikes. The Deck of Playing Cards are a great collectors item too! Buy the cards separately too: great gift item! Its a conversation piece at any card game. Its been produced here in the States and is of the highest Quality. Both the Game and the Cards are a part of a limited edition. -- Never to be re-created. Click here to order the Officially Sanctioned, Collectors Limited Edition "To Sturgis & Back on $500" board game.